Val’s officially a junior. It’s a new school year, and another chance to try and be invisible. Being in the spotlight with the popular crowd wasn’t as glamorous as she had once thought, and Val had to learn the hard way. But her plan for invisibility shatters when the school’s most feared bad boy Nathan Alexander steps into the picture. Any sane person would’ve been afraid of him, but having daily conversations with Lucian, a talking cat Val fatefully rescued, doesn’t help prove she hasn’t lost her marbles. Forced to tolerate each other’s presences during after school detention every day Val learns there’s more to Nathan and his motorcycle than meets the eye. In a sea of rumors and quick wildfire-spreading gossip it’s difficult to tell truth from fiction. Val begins to question if Nathan’s really the cold-hearted delinquent that the student body is convinced he is. Just when Val thinks everything is almost normal again Lucian lets her in on a little secret; he knows who her soul mate is. All Val wanted was to lay low but she can’t help that her heart beats like a drum whenever she’s around Nathan. You have no idea how excited I am about all of this! For the past couple of years I have started writing several novels only to eventually scoot them to the side, start another one, and continue the infinite process. This is the first time I've almost finished a novel except for that time in third grade when I wrote a story about an evil grim reaper and a wizard that made magical armies and fought until the death alongside unicorns. But that wouldn't really count...would it? The draft is almost complete and once I hit the last word on the keyboard I'm going to close it up and hide it away for a month. What?! Why?! You're probably wondering. Well because if I straight away begin the editing process of the novel right after I finish writing it the chances of me missing mistakes are greater than if I wait a month prior to scavenging for grammatical and spelling errors. It will then be edited a few more times by other people and then will be in the publishing process! I'm not going to ship this book off to any publishers because I'd prefer to self publish it. If everything goes well and the feedback is great then I'll consider sending it to a publisher, but I don't want to count my chickens before the eggs hatch. I originally wrote this book for my sisters to give them for Christmas this year and the submission process for most publishers requires up to six months of waiting to hear back and I just can't afford that kind of time with this book. I know there are a lot of people who wouldn't even consider to touch a self-published novel but I don't care, I'm always rooting for the underdog. I'll let you guys know when I decide on the official publish date and possible free pdfs for book bloggers that would like to review the book. I've grown attatched to a lot of the characters in the book especially Nathan, sweet, sweet , misunderstood Nathan and I can't wait to share the story with you guys too! I hope everyone's having an awesome beginning to their summer! 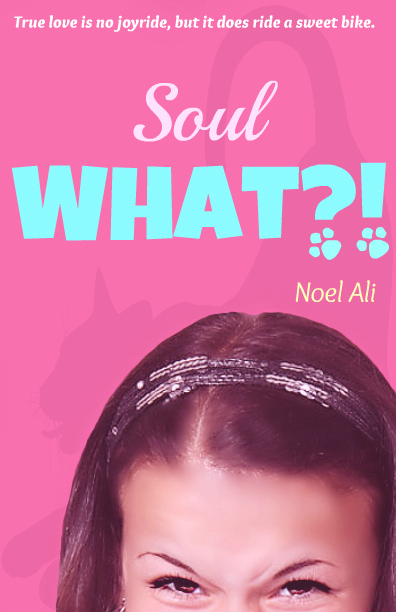 Congrats on your book, Noellie! The cover is super sweet and the storyline sounds intriguing. I wish you the best success when you release it! P.S. I smiled when I read about your 3rd grade book:) I wrote one in 3rd grade, too. Mine was about a girl and a dog(I wasn't allowed to have one)and I think I still have the MS stashed away somewhere. Thank you Christine! :)Awww that's adorable, that's the cool thing about writing stories, you can create a world or scenerio where your dreams can be true and you can live in them. You've won the Leibster Award! Visit http://joyanne-decomyheart.blogspot.com/2012/07/leibster-award.html. Congrats! That is very exciting! Thank you! :) and thank you for following, I truly appreciate it.